Is the international community – and ASEAN in particular – getting carried away by the change in Burma? Burma’s opposition leader Aung San Suu Kyi has picked up another award, confirmed she will run for parliament and says her country is on the verge of a breakthrough as its nominal civilian government promises to continue instituting democratic reforms. While being presented with the Asia Society’s Global Vision Award, the Nobel Laureate told an audience assembled at the Waldorf-Astoria hotel in New York that her contacts with the Asia Society went back decades to when she worked in New York for the United Nations Secretariat. “Now that Burma is on the verge of a breakthrough to democracy, we have not yet made the breakthrough, we are on the verge of making such a breakthrough, we look to friends like you to help us along this difficult path,” she said in a taped interview. It was an honest assessment for a world still beguiled by the Burmese military and President Thein Sein, who came to power a little over a year ago through elections, the first in 20 years, which were condemned as rigged. Since then, he has freed political prisoners, including Suu Kyi, announced a raft of reforms and opened talks with the nation’s ethnic rebel factions, striking a truce with the Karen National Union. The award also came as the 10-member Association of Southeast Asian Nations (ASEAN) called on Western nations to lift sanctions against Burma. ASEAN foreign ministers made the call while meeting at Siem Reap in Northwest Cambodia. Cambodian Foreign Minister Hor Namhong, whose country has just taken over the chair, led the calls, saying democratic reform in Burma was now moving ahead. “ASEAN foreign ministers have all agreed to reiterate their call for the lifting of economic sanctions on Myanmar (Burma),” Hor Namhong explained, adding ASEAN also urged the United Nations to close its Burma human rights office. As such, there was no need for sanctions, the U.N. human rights office or formal international debate about the situation in that country. The ASEAN stance is too optimistic. Burma still has a long way to go before making an acceptable transition to a fairer society. Releasing people who should never have been jailed in the first place isn't grounds for a reward or even an acknowledgement that reforms are real. As a former political prisoner of the Khmer Rouge, and a rare survivor of that regime, Hor Namhong should know this. 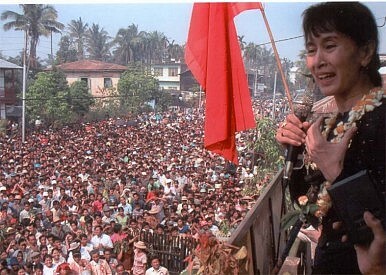 By-elections have been scheduled in Burma for April 1, which could result in Suu Kyi being returned to parliament. Sein and the generals will no doubt welcome her if this means an end to sanctions, which have hurt them financially and cast doubt over their legitimacy as the country’s leaders. But what they have to gain has more to do with their personal ambitions. She acknowledges this could still be some time off and the road will be difficult. The rest of the world, and in particular ASEAN, might want to pay attention.